Our 2.75-hectare (7-acre) site is located at the mouth of the historic Michipicoten River on Lake Superior’s eastern shore, a 10-minute drive from the town of Wawa (pop. 3,000). Two centuries ago, it took Northwest and Hudson Bay Company fur traders an arduous two months to paddle here by birchbark canoe; thanks to planes, buses, trains and automobiles, the journey is much faster for the modern-day voyageur. Our guests have woken up at home in England, Germany and France and fallen asleep to the rhythmic swell of Lake Superior on the same day. Contact us today and we’ll be happy to assist you with your travel arrangements. Coming from the south (Sault Ste. Marie), drive 220 kilometres north on Highway 17 to the Michipicoten River. The total driving distance from Highway 17 is 5 kilometres on well-maintained roads. 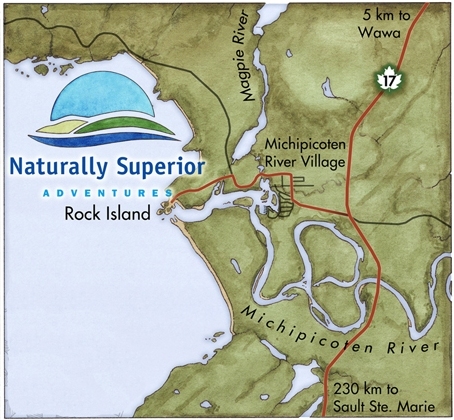 You’ll see lots of blue and white Naturally Superior Adventures signs along the way. At the first T intersection, turn right. Continue approximately ½ kilometres north (across one bridge)to the next T intersection. The road turns to gravel and a bridge crosses the Magpie River. Moments later, just past a small cemetery, you’ll see a power generating station. Turn left at the base of the hill and continue about ½ kilometres to Naturally Superior Adventures and Rock Island Lodge, at the end of the road. We are located at 47° 56′ 4.59″ N, 84° 51′ 3.00″ W.
The nearest full-service airports are located in Sault Ste. Marie (YAM) and Thunder Bay (YQT). Both are serviced by regular flights from Toronto’s Pearson (YYZ—Air Canada, WestJet) and Downtown (YTZ—Porter Airlines) airports. (Travel tip: A layover in downtown Toronto allows you to experience the best of Canada’s largest city en route to your wilderness getaway in Northern Ontario.) More details. Twice a day, eastbound (departing Thunder Bay) and westbound (departing Toronto and Sault Ste. Marie) Greyhound buses service the town of Wawa. We can pick you up at the bus terminal and drive you to your lakeside retreat. More details. 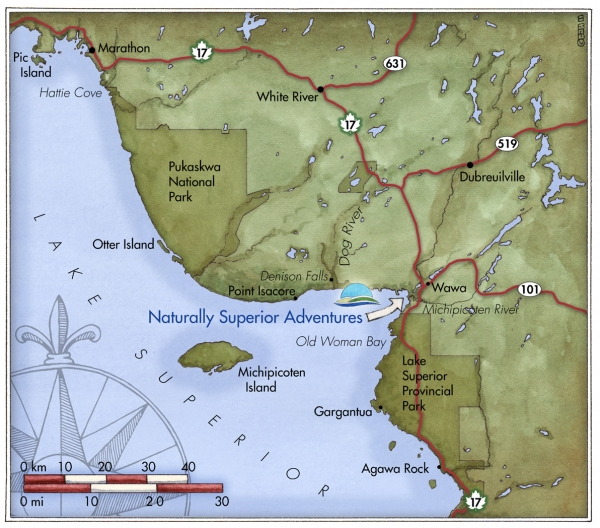 To expedite your arrival, Naturally Superior Adventures staff can pick you up at the Sault Ste. Marie airport and offer an interpretive 2.5-hour car ride north on one of Canada’s most scenic highways to our location on Lake Superior. * Limousine service and ride-share arrangements may be possible. Contact us for more information.